Will the NOOK Simple Touch with GlowLight shine in fiscal 2013? As sales of Barnes & Noble's Nook eReader decline, the bookseller is counting on the new NOOK Simple Touch with GlowLight to pick things back up. The company revealed in their financial report for fiscal 2012 that Nook sales declined, particularly in Q4, dropping more than 10 percent. "Device sales declined during the fourth quarter due to higher third-party channel partner returns, lower selling volume and lower average selling prices," the bookseller wrote. 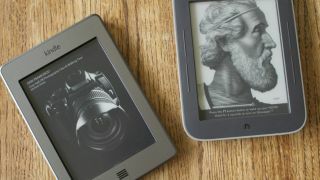 Barnes & Noble is counting on the new Nook Simple Touch with GlowLight, which launched in Q1 of fiscal 2012, to bolster dwindling hardware sales. The company claims that the Simple Touch "has quickly become the highest rated eReader in the market." Hardware sales may have dropped off at the end of fiscal 2012, but Barnes & Noble also reports that digital content (digital books, newsstand and apps) is selling more than ever. Content sales hit $483 million for the year and grew 65 percent from Q3 to Q4 and 119 percent year-on-year. Altogether, the company's e-reader business (including hardware, accessories, and digital content) brought in $993 million in revenue for the year and $164 million in Q4. That's a 45 percent increase year-over-year, as well as a one percent increase overall in Q4 in spite of lagging Nook sales. "As we look out to fiscal 2013," the financial report says, "we feel the company is strategically well positioned to grow value for shareholders." Barnes & Noble's recently announced partnership with Microsoft, known as Newco, is still under wraps. The tech world was hoping to learn more about the collaboration during Microsoft's LA press conference yesterday, but Barnes & Noble confirmed early in the day that they were not involved in what was revealed to be the Microsoft Surface. Barnes & Noble's 2012 fiscal report says the company's still "actively engaged in the formation of Newco and is in the process of implementing the work necessary to complete the separation and close the Microsoft transaction." The report defines Newco as "comprised of the company's NOOK digital and College businesses."